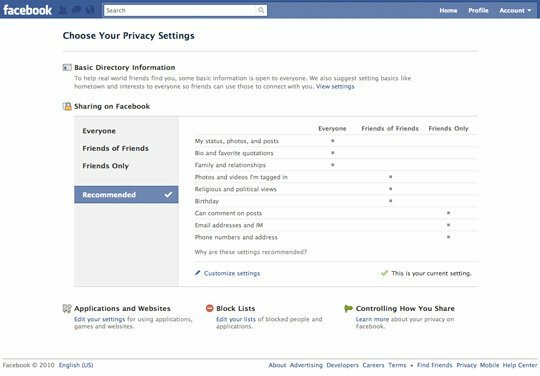 Facebook has revamped its Privacy Settings and they will be rolled out in phases to users over the next couple of weeks. Facebook has focused on three things: a single control for your content, more powerful controls for your basic information and an easy control to turn off all applications. First, Facebook has built one simple control to set who can see the content you post. In a couple of clicks, you can set the content you’ve posted to be open to everyone, friends of your friends or just your friends. Second, Facebook has reduced the amount of basic information that must be visible to everyone and are removing the connections privacy model. Now you will have the ability to control who can see your friends and pages. These fields will no longer have to be public. Third, Facebook has made it simple to control whether applications and websites can access any of your information. Many of you enjoy using applications or playing games, but for those of you who don’t this popular social networking website has added an easy way to turn off Platform completely. This will make sure that none of your information is shared with applications or websites. Check out the new Facebook Privacy Guide for instructions on how to set your Privacy Controls.